Our favourite way to approach the cathedral is from the South Bank of the Thames over the Millennium footbridge near Tate Modern. As you approach from here, you get to see just how impressive the structure is. As with many large churches these days, tourists have to pay to get in, which always annoys us, but at least with this one you get to take the impressive trip up to the dome. We thought this was a fantastic experience, and we particularly enjoyed the opportunity to go outside and look at the views of London. On the dome level, you’ll find the famous “Whispering Gallery” where the acoustics allow you to whisper to someone on the other side and still be heard. It’s probably best not to look down for too long because you realise just how high up you are! Sadly, the trip up the galleries is only accessible by stairs. St Paul’s Cathedral is open Monday to Saturday between 8.30am and 4pm (last ticket sold). The galleries (climbing the dome) are open Monday to Saturday between 9.30am and 4.15pm (last admission). St Paul’s is not open for sightseeing on Sundays, only for the usual services. Adult admission is £13.50 (2012 prices) but is free with the London Pass. Guided tours take place at 10.45am, 11.15am, 1.30pm and 2pm and are included in the admission price – you just need to book when you arrive at the Guides desk. 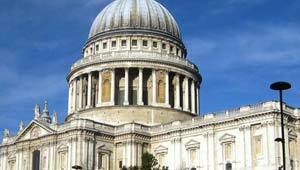 You can gain free entry to St Paul’s and get a discount in the cathedral shop with the London Pass which is worth having if you plan to visit many of London’s top attractions. St Paul’s Cathedral is near the Bank of England in central London. The nearest tube station is St Paul’s.